[Fileark] had the backlight on his digital picture frame go out one day. These are generally Cold Cathode Fluorescent Lamps which require an inverter to source the voltage necessary for proper operation. When they stop working, the inverter is usually to blame. Since that circuit is made up of pretty small surface mount circuitry, he decided to replace the backlight with LEDs rather than repair the inverter. In the video after the break [Fileark] will walk through the entire project. After snooping around inside the picture frame he sizes up a strip of LEDs on a flexible substrate. The metal retaining bracket that hosts the LCD must be altered to fit the new light source and for that, he’s included a hacking montage in his video. The final result looks stock and he estimates the screen is around 97% as bright as with the original backlight. This isn’t the first time we’ve seen an LED edge-lit upgrade. The last one we saw even used a custom PCB to host the LEDs. Cool. I did this for my handheld oscilloscope to reduce interferences caused by the CCFL inverter. Works beautifully and enables different tones of white and better looking colors. 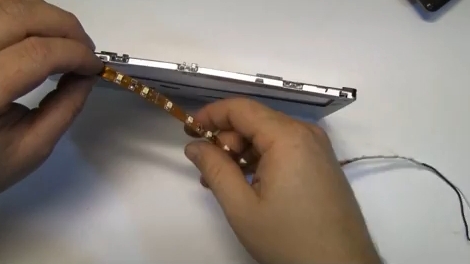 How effective do you reckon this would be as a laptop backlight fix? I work for a repair place, and being able to do that rather than wait on an inverter from Taiwan would make many people happy. looking at the end of the video with a bright picture, I would’ve thought people wouldn’t appreciate the uneveness of the the light from the leds, it really does look like a bunch of leds instead of an evenly spread out source, I wonder if it couldn’t be made better using a diffuser of some kind between the leds and the LCD edge? I noticed this too, but he used an LED strip with considerably wide spacing. Using something with tighter spacing (commonly available) would solve this issue. @Crustacean: This is like fixing their powersupply with ducttape instead of ordering a new one. Effective, but not good in the long run (If it breaks again, and you arn’t around, they are SOL [And hello liability]). @Guest, no. You fail at grammar naziing. The audience is not who is walking through the project, Fileark is. Check those dispersing sheets if they are in the proper order. How about using LED filaments? making a homemade glass tube with the filaments inside then backfilling with He would be remarkably cheap and would allow recycling of otherwise useless panels that might easily last another 10 years.